I am in awe of writers who write historical novels, or other genres which need an enormous amount of research. All the novels I’ve written so far have required some research, but nothing that underpins a whole novel. 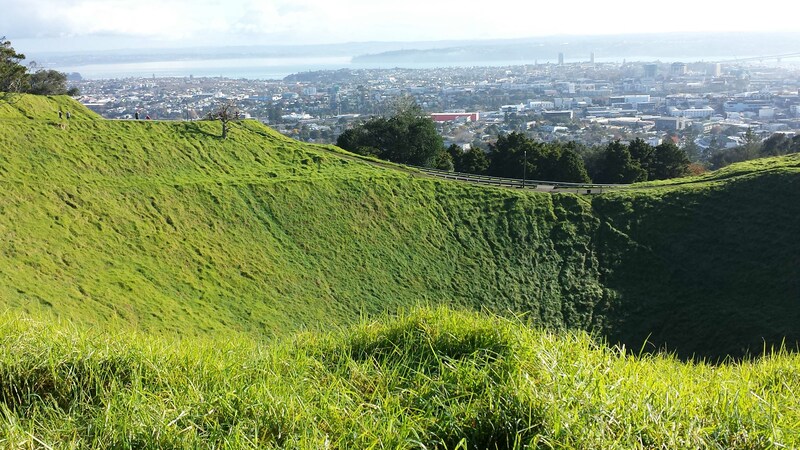 Today, I spent a beautiful autumnal morning walking up Mt Eden and One Tree Hill in the name of research. The exercise was good, and after a week at work hardly stirring out of the office it was lovely to be out and enjoying the weather. Some novels need a particular location, but my current work in progress doesn’t have that restriction, and I decided it would be fun to set it here in Auckland. I’ve had immense enjoyment in considering specific locations for scenes and including details about local areas. Some of the locations aren’t too important, but there is one scene that proves to be memorable for Anna, the main character, and almost by chance I decided to set it at One Tree Hill. At the time I initially wrote the scene I didn’t know it was going to be important. That’s one of the things I love about writing, how the characters take over and things you decide almost by accident, resonate later in the novel. This happened with One Tree Hill, and it became the location for several important scenes later in the book. Like most Aucklanders, I know One Tree Hill and Cornwall Park well enough, but it has been a couple of years since I was there, and so I wanted to visit it again to check my descriptions and that the character movements were accurate. It could be a form of procrastination, as most of my readers will never visit Auckland, let alone One Tree Hill, but I like to know my descriptions are accurate. I also love the areas I’ve chosen for my novels and want to give people a flavour of them. The thing with research is that when you’ve spent time on a subject, whether it’s a location or something else, there is a desire to pack the novel with everything you’ve discovered. The real secret is to sprinkle enough through the pages so the reader understands, but not so much it feels like an information download. From my novel you won’t find out much about One Tree Hill, Cornwall Park or Mt Eden other than a couple of brief mentions so here’s a little a little more, if you’re interested. Auckland is built on a volcanic field and has around 50 volcanoes, many of which are now favourite parks and weekend walks. Fortunately the volcanoes have been quiet for a long time. The most recent eruptions in the region were from Rangitoto between 550 and 600 years ago. When I think of Auckland, it’s Rangitoto Island that always comes to mind. It’s about 5 km wide and is visible from many areas of the city, and is a favourite place for tourists and locals to visit. There are a number of tracks around the island and up to the summit. Here are two photos from today. The first one is Mt. Eden crater and the second is One Tree Hill. Mt. Eden is in a central Auckland suburb and has beautiful views over the Hauraki Gulf towards Rangitoto. 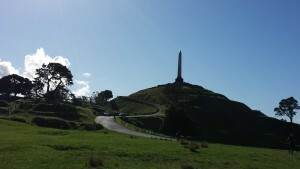 One Tree Hill is situated in Cornwall Park and is a little further out from the central city. 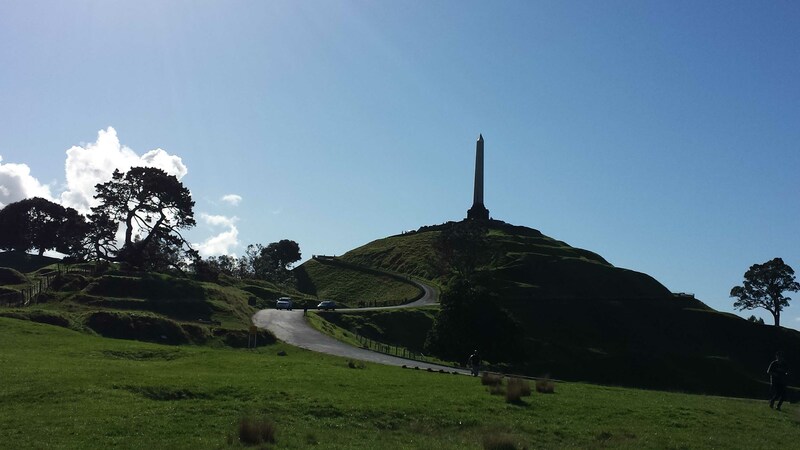 What you see in the photo of One Tree Hill is an obelisk, there hasn’t been a tree on the summit since 2000 when the tree was attacked and had to be removed. To finish here’s a snippet of trivia, U2 wrote the song ‘One Tree Hill’ in memory of a Kiwi who worked with the band. I’ll be back in a couple of days with some more ramblings about researching for writing. If the meantime if you’re interested in finding out a little more about the volcanoes, here are some links.